Media - Precious Metals Processing Consultants, Inc.
Save nickel, zinc and copper from going down the drain. Electrowinning reduces waste, recovers valuable metals. 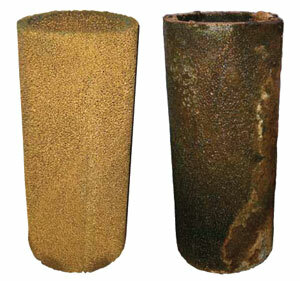 Above, a before and after look at PMPC’s “Gold Bug” system, which uses a metallic matrix of surface area in a cylindrical cathode. Below, combined with the turbulence created by a dedicated pumping system, it exposes the cathode to a continuously renewed concentration of fresh ions. Epner, owner of Precious Metals Processing Consultants in Palisades Park, NJ, is a pioneer in the electrowinning process that removes metallic ions from concentrated rinse water and spent process solutions. For several decades he had only who deal mainly in precious metals such as gold and silver to capture the elements from tanks before they are disposed. But rising costs on nearly all raw materials had made Epner and other electrowinning system sellers like him go after a broader market. “Even though precious metals is in our name, we are looking to make recycling heavy metals easier as the price of all commodities are going up,” says Epner, who has been in the business for more than 30 years and whose main products are the GoldBug and the Ionnet systems. His systems use a metallic matrix of large surface areas, which is formed into a cylindrical cathode (in the case of the Gold Bug), or flat sheets (for the Ionnet). Epner says that combined with the turbulence created by a dedicated pumping system, it exposes the cathode to a continuously renewed concentration of fresh ions. He says this means fast plate-out to very low concentrations. Electrowinning, which is also called electroextraction, is the electrodeposition of metals from their ores that have been put in solution or liquefied. Electrorefining uses a similar process to remove impurities from a metal. But gold and silver remain the chief target of companies like Precious Metals Processing Consultants. Remco has a suggestion for who should be electrowinning: Rule o involves lean electrolyte containing 10 to 20 g/L sodium cyanide at pH >10.5—adjusted with sodium hydroxide—being heated to 90°C and pumped up flow at two bed volumes per hour through a stationary bed of activated carbon loaded with gold. 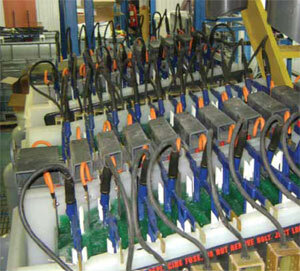 An example of SX Kinetics success is a gold mining company in Indonesia that features 15 cathode boxes containing steel wool and 16 stainless steel anodes. This gold electrowinning plant is able to produce up to 140 kg of gold per day, says Webster. Epner’s Ionnet system is a fairly simple process for those requiring large volumes of precious metals recovery or normal volumes of heavy metals recovery. He says that cathode. The turbulence created at the cathode interface ensures high plating efficiency, translating into fast plate-out at very low concentrations. Each lonnet cathode can hold up to 30 lbs of metal, or 150 lbs for the whole cell. Epner says the system is designed for easy access to all electrodes, and that some of the various solution types for typical applications are copper sulfate, copper cyanide, cadmium cyanide, gold cyanide (stripper solutions), various nickel solutions, palladium, palladium nickel and silver cyanide. His customers are big believers in the system. Jack Seidler from Interplex Industries in Flushing, N.Y., wrote to Epner to tell him that after installing the GoldBug system, he extracted almost 40 ounces of gold in the first month of use, essentially tripling his previous results. “Not being too stupid, we immediately installed GoldBugs in all of our tanks,” Seidler wrote. After installing the GoldBug system, Jack Seidler from Interplex Industries extracted almost 40 ounces of gold in the first month of use, essentially tripling his previous results. A comparison of hourly samples while electrowinning. Metallic ions are removed from concentrated rinse water and spent process solutions. “I can tell you that this was the single best investment in equipment I have ever made, bar none,” Szabo says. It was created to promote pollution prevention—known as P2—and to identify P2 technology needs, and accelerate P2 technology transfer within various industries in southern California, including research and studies on electrowinning. A case study involves All Metals Processing Co., a small job shop in Burbank, Calif., that performs cadmium, bronze, and zinc electroplating and black oxide coating for aerospace and other industrial customers. All Metals employs 15 workers, and its facility has about 8,000 sq ft of space for plating operations. All Metals set a goal to reduce water use and eliminate wastewater discharge to the sewer, motivated by high city sewer fees and pressure from the municipal wastewater treatment plant to decrease the metal concentrations in treated wastewater. In cooperation with the Merit Partnership, All Metals agreed to pursue its goal in two phases, focusing efforts on the cadmium electroplating line because it was the most frequently used process line; dragout from this line contributed the largest quantities of metals to the wastewater, and All Metals had exceeded its cadmium wastewater discharge limits on several occasions. Phase 1 involved evaluating overall process efficiency and control. The purpose was to reduce dragout and optimize rinse water use to the maximum extent feasible before selecting and purchasing recycling or recovery technologies. Phase 1 modifications resulted in a 50 percent dragout and rinse water reduction, a 60 percent wastewater treatment chemical reduction, improved rinsing quality, and more efficient work flow; the Phase 1 payback period was 1.7 years. By improving overall process efficiency first, All Metals was able to more cost-effectively apply a metal recovery technology and move toward eliminating cadmium wastewater discharges to the POTW. For Phase 2, electrowinning was determined to be the most feasible technology for All Metals to reduce or eliminate wastewater discharges from the cadmium electroplating operation. The electrowinning unit is operated at the All Metals facility 24 hours a day, 7 days a week. The cathodes are replaced every three months on average. 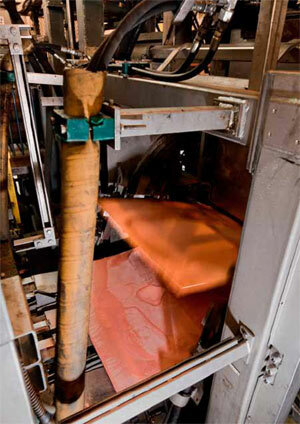 Based on the start and finish weights of the cathodes, about 2 kilograms (4.4 lbs) of cadmium was recovered on the six cathodes after two months of operation. Spent cathodes are picked up by a scrap metal dealer for recycling. Before the electrowinning unit was installed, rinse water flowed through the counterflow rinse tank at a rate of 0.5 gal/min. Since the electrowinning unit was installed, all the rinse tanks have been operated in a stagnant mode, and the temperature of the rinse water in Rinse 2 has been maintained at about 115°F, resulting in the evaporation of about 15 gallons of rinse water per day. Consequently, 15 gallons of clean water per day is added to Rinse 3 in order to compensate for the water transferred into Rinse 2 to make up for evaporative losses. Based on comparison of water use on the cadmium electroplating line before and after installation of the electrowinning unit, rinse water use has been reduced by 94 percent and wastewater is no longer generated from the rinses. Because not all dissolved solids are removed by the electrowinning unit, conductivity is monitored in Rinses 1 and 3. Rinse 3 is drained to dispose of the dissolved solids buildup and replenished with clean rinse water every six weeks on average. The drained rinse water is evaporated onsite by All Metals. In addition, cyanide concentrations are periodically measured in Rinse 1; these concentrations have been significantly reduced by the electrowinning unit. After installation of the electrowinning unit, no increase in the number of reject parts occurred, and no adverse impacts on production were observed. Motivated by the success of the electrowinning unit for the cadmium operation, All Metals has installed another electrowinning unit in a copper electroplating stagnant rinse.